Are your old white cotton socks getting old and need something new to cycling in? Whats the deal with cycling socks are they really better? You bet they are! Cycling socks are constructed out of a cotton/polyester blend which wicks the moisture away from your feet when they get sweaty. Whats wicks mean? It means it drys the sweat away and keep your feet dry and more comfortable. These things are so comfortable you'll use them for everyday wear not just cycling socks. We wear them all the time. There is also a little extra padding in the toe area and heel for a little more support and comfort. They feature a 5" cuff on them as well. Is there an advantage to that? No not really just more of a style thing. They look really cool with that big beer mug on them. 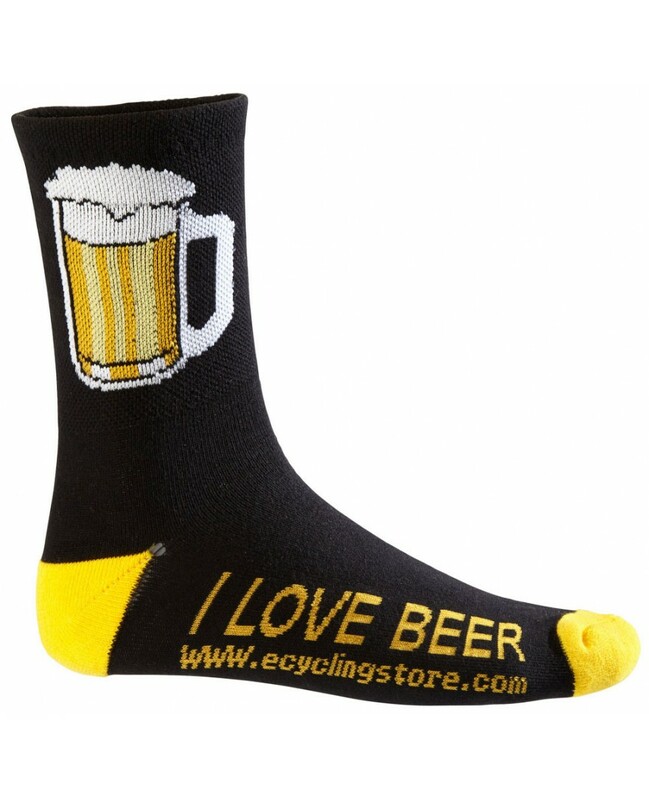 Most cycling socks run in the $10 to $15 range not ours. We work directly with the manufacturer to save you money and they are Made in the USA! Even better. These are high quality cycling socks not cheap imports or seconds. We at eCyclingstore work hard to bring you only high quality items that stand up to our demands and expectations. We stand by every product we sell or your money back.